All the benefits of the regular SideKick plus a flexible 3 foot hose and convenient shoulder strap! Instead of waiting for your vehicle to dry itself, blast water away with the Metro Blaster SideKick. The compact Blaster SideKick is a hand-held companion to Metroï¿½s popular Air Force Blaster. The SideKick blasts your car or bike dry before water spots form. Hit the road faster with the Blaster SideKick! Blast water out of cracks and crevices! Works great for detailing engine bays. The Metro Blaster SideKick is an compact, handheld dryer for motorcycle and car owners because it removes water from places where towels cannot reach. When the vehicle or motorcycle is driven, these water droplets stream down the body panels and leave streaks and spots. 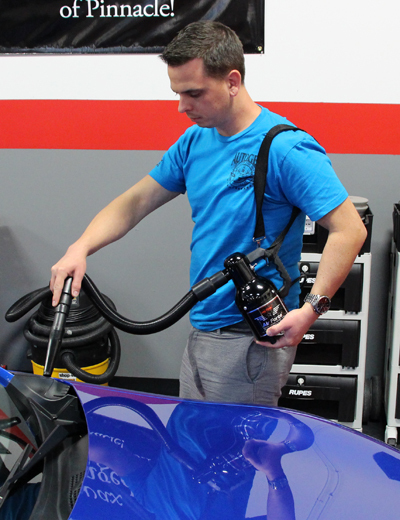 The Blaster SideKick eliminates the water in crevices and on body panels before it has time to dry, in order to prevent ugly water spots. The Professional Series features a flexible 3 foot hose and a shoulder strap for added convenience. The Metro Blaster SideKick weighs just over 3 pounds, making it an excellent travel companion. The SideKick fits into saddlebags or into car trunks so you can blow dry your vehicle or motorcycle when youï¿½re away from home. When prepping for a car show or bike event, the portability of the SideKick is a real asset. The Blaster SideKick runs on a 1.3 HP motor powered by a 12 foot grounded cord. It includes a rubber neoprene blower nozzle to direct air into tight spaces and an air fan nozzle for drying body panels. The SideKick is constructed of all steel in the U.S.A. and carries a 1 year manufacturerï¿½s warranty. Donï¿½t give water spots a chance. The Metro Blaster SideKick blasts away water with warm, filtered air to leave your vehicle or bike dry and spot-free. So you dried off your entire vehicle using the Metro SideKick and the softest, most absorbent towels known to man - the Waffle Weave Guzzler, but when you walk out to the vehicle a couple hours later your worst nightmare becomes a reality - drips of water have created unsightly water spots! Donï¿½t sweat it; these annoying droplets of water are bound to happen, no matter how careful you are. They come from behind emblems, in between body panels, fuel filler doors, and any other crack or crevice where water can hide. Donï¿½t panic and grab a towel only to vigorously rub the surface, inflicting toweling marks (fancy for scratches). Instead, grab a bottle of McKee's 37 High Gloss Detail Spray and a Gold Plush Jr. Microfiber Towel. Spray the affected area and wipe away the water spots ï¿½ itï¿½s that easy! Youï¿½ll appreciate the added gloss and slickness, so much so that you might even be tempted to wipe down the entire car (go for it!). This blower is very useful for drying smaller vehicles especially those that have been ceramic coated. Useful for wheel wells, tyres. But uses can be found around the home where a blast if warm air is useful. It is solid and well made and has a filter at the intake port at the base. The Metro Blaster Sidekick is well made and a compact size. It is not good for drying the entire car, I find that I will still chamois the car first then use the Metro Blaster to blow water from trim, mouldings, etc. I do spray finishing in my business and I use waterbourne finishes and I find that the Blaster is good for blowing moisture out of nooks and crannies in my spray gun after cleaning it. ProsWell made, compact size, I've found other uses for it. ConsNot good for drying the entire car. If you want to dry your car this isn't for you. The blower leaks as much air from its housing as it blows out the hose. Might be designed to be used on your riding lawn mower or bicycle but not a car. ConsLeaks a lot of air from its case. Will take you way to long to blow the water off your car before it dries with water spots. Used my Metro Blaster Sidekick this weekend for the first time for both my daily ride and classic car. Was very happy for the added advantage of drying all the areas that have not been totally reachable in the past i.e behind mirrors, body seams, behind car doors, around tires, and yes even the engine compartment. Also great for car interiors to blow out where a vacuum has trouble reaching. As for the mfg "Metro" they are a quality house I use their line of professional hair stand hair dryers for grooming my show dog(s). ProsWell made not cheaply manufactured. Light weight ergonomic handling with balanced air velocity for not overpowering when using in close proximity of car body. Hose expands when power is on and contracts when off for easy storage. ConsProvided with a should strap but will forgo using to better ensure/preventing accidental bumping of car during use.